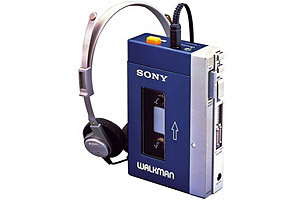 Long before there were iPods and BlackBerrys, the Sony Walkman TPS-L2 (a.k.a. Stowaway, a.k.a. Freestyle, a.k.a. Soundabout) was one of the first pocketable personal electronic devices. The portable stereo system went on sale in Japan in the summer of '79 and shipped with a set of lightweight headphones. Sony included two separate headphone jacks labeled "guys" and "gals" so you could share your music and not come off as being antisocial. There was even a "hotline" feature that allowed listeners to speak to one another without taking their headphones off or pausing the music. The TPS-L2 created a whole new category of personal, mobile music that Sony ruled for nearly two decades.